Angela was born on 28 July 1956 to her mum and dad Louise and Mark Niman, later with her younger brother, Jeremy. The children grew up in a warm and comfortable Jewish family near Whitefield in Bury. Their father was the Managing Director of an innovative small company. Angela went to Derby Technical and Grammar School, Radcliffe Road, Bury. She won many swimming badges, and went from there to Bolton College of Art to study graphic arts. Angela then went to work in an advertising agency and met and married her husband, Colin Madeley, divorcing around 25 years later. Together they worked as pub landlords, first at the White Bull in Longridge in the Ribble Valley, and then at the Golden Lion on Hillgate in Stockport. Angela also ran a dress shop on Wellington Road in Stockport, developing further her artist’s eye for design and colour. Acquiring an impairment and experiencing first-hand the discrimination faced by disabled people, she joined the Greater Manchester Coalition of Disabled People (GMCDP) in 1993 as an executive member, and then became the company secretary the following year, from 1994 to 1999. Her role on the executive continued to 2009. Angela was a keen activist in the peaceful street protest group DAN, the disabled people’s Direct Action Network. She was highly visible at such protests, dressing as ever in highly vibrant colours and with her bright, spiky hair. In her flat all around the living room she had amassed an extensive collection of beautifully detailed clown and harlequin dolls. One visitor commented that they had not seen so many clowns since the last government’s transport committee, a story which amused her. Angela was also involved in Breakthrough UK Ltd, a non-profit company controlled by disabled people and working to overcome the barriers to employment for disabled people. She was the company secretary from December 2002 through to June 2013, though she had been involved with the business from before registration in 1997 and she was a director from 2000. In 2005, after much searching, Angela finally managed to find and buy an accessible apartment in Manchester city centre, near to Oxford Road train station. Her searching campaign was described in an article in the Manchester Evening News, copied below. Angela died on 19 June 2015 while staying in hospital. It is with great sadness that Breakthrough heard the news of Angela’s death on 19th June 2015. Angela had been involved with Breakthrough since our inception in 1997. We send our sincere condolences to her family and friends at this very sad time. 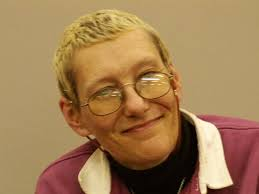 Angela had been actively involved in the Disabled People’s Movement, as well as being a Disability Action Trainer and Chair of Greater Manchester Coalition of Disabled People (GMCDP). It was as an Executive Member of GMCDP that Angela first heard and got involved in establishing Breakthrough UK. Angela’s funeral took place on Thursday 2nd July at the Old Chapel, Manchester Crematorium which was adjacent to Southern Cemetery. Her family had requested no flowers and that any donations be made to the World Wildlife Fund (WWF). Angela requested that there be no mourning clothes, but instead that bright colours be worn please! If you have been struggling to find your perfect new home spare a thought for Angela Madeley. Angela has been confined to a wheelchair since developing multiple sclerosis 20 years ago and it took almost two years for her to find a suitable city centre apartment. Angela, 49, decided to move following the death of her long-term partner two years ago [in March 2004]. She registered with half a dozen city agents setting out in detail her very specific needs. With a considerable budget of £220,000 she expected to have a wide choice but spent 16 exhausting and frustrating months looking at property after property, none of which were suitable. Driven to despair she contacted Garrington, the property finder company founded by Phil Spencer of Channel 4s Location, Location fame. She said: “Phil Martin from their Nantwich office came to my house to find out exactly what I needed and then looked at lots of places before recommending two for me to see. With the help of city agents Savills he found a very large two bed apartment in the Quadrangle Building, just behind Oxford Road, where the developers, In a City, were prepared to alter the internal layout to Angela’s specification and make other adaptations like wider doorways and lower kitchen worktops. She moved in last month and despite some teething problems (one of the doors was hung the wrong way so she cannot get into the hall store) she is delighted with her new home, which cost £218,000 in total. But, despite the co-operation of the developer, some features remain inaccessible. The balcony, a feature Angela particularly wanted as she enjoys sitting in the sunlight, is reached via a step. She is talking of installing a ramp so she can get up but a sliding patio door, flush to the floor, would have solved the problem for her and opened up the space. Manchester City Council now insists that all developments have a wide hallway and a disabled access toilet but that seems to be the extent of inclusive planning. Maybe it would be a better strategy to ask developers to leave one or two units as shells so they could be adapted for disabled living if a buyer came along rather than make token efforts in the entire block. Angela’s story has a happy ending and she would urge other wheelchair users not to give up if they want to live in the city. She said: “Don’t be put off because it can be done and the more questions are asked of developers and agents the better their response will be. At the moment they would seem to have no comprehension of what a disabled person’s requirements may be. Garrington’s Phil Martin said: “The challenge was to find a building under construction where we could customise the shell. The Royal Mills scheme at Ancoats offered spaces that could be adapted but they are not ready until next year and Angela wanted to move swiftly. “We sat down with Ian Jones from In-a-City, explained what was needed and they were incredibly helpful, positive and flexible about carrying out the work.